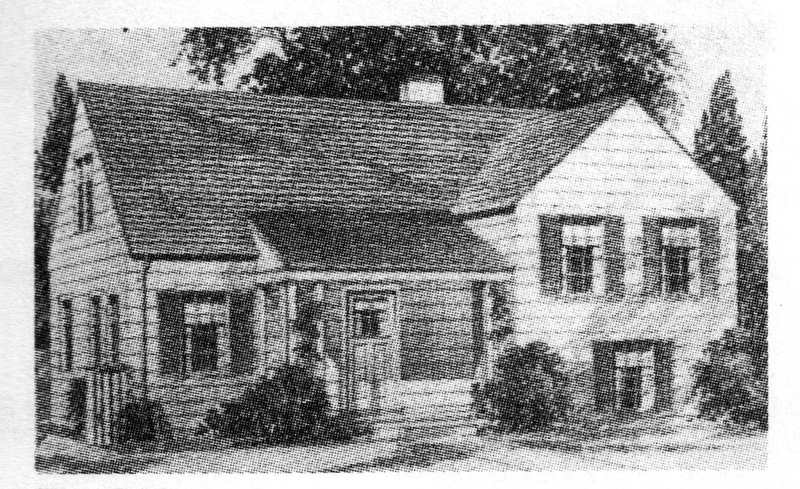 "You Are Most Welcome at the Little 'White House'"
1618 North Rand Road, Arlington Heights. The Sears Old Town. Scan is from Houses by Mail. Here's a super-rare Sears house thousands of people drive by every day. It's located on Rand Road, in the middle of a commercial area. Somehow this Sears Old Town managed to survive and it is currently housing Jordan & Associates, an accounting firm. The Sears Old Town is very similar in style to the Sears Homestead. There is a Sears Homestead in Mount Prospect, and seeing that house in person helped me identify the Old Town. The Sears Old Town was offered one year only--1933. That year, Sears sold less than 500 houses in the U.S., which would make the Old Town one of the rarest models. We know that the house was built in 1933 or perhaps 1934. I don't have information on the original owners since houses on Rand Road were not numbered until after 1940. In August 1969, Rasmussen's Gifts took over the house. The "gift butik" specialized in Scandinavian gifts (owner S.P. Rasmussen was a Danish immigrant). The slogan for the gift shop was "You Are Most Welcome at the Little 'White House'". A 1972 ad for Rasmussen's Gifts from the Chicago Tribune. In May 1979 the owners retired and listed the house for sale. In early 1980, it was purchased by the current owners and continued to be used for commercial purposes.